We started this project by removing all the old musty carpet throughout. 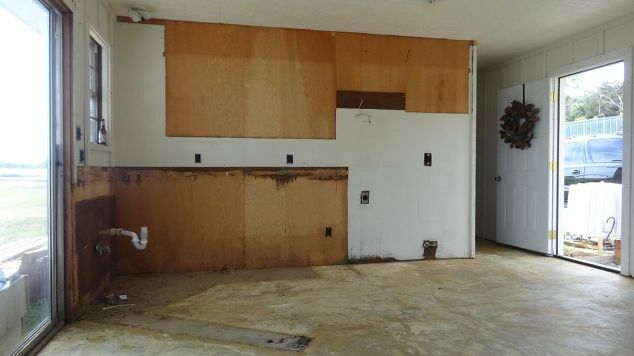 Then we completely gutted the kitchen area, being careful to save all the cabinetry, because we planned to reuse/repurpose all that was possible for the new cabinets. Then we painted and added laminant flooring. I had to do a lot of patch work on the rough walls. We opted to just try and fill in the cracks because we were going for the industrial farmhouse look. We also replaced all of the outlets and rewired to accomodate the lighting for the shelves and pendant lights over the island. The ceiling of the entire cabin was styrofoam tiles, that are not available anymore. This was a tricky task because the original overhead light was a diasaster and we wanted to add the pendant lights over the island...it was several hours of very gently removing and rearranging those tiles so we wouldn't have to replace the entire ceiling. 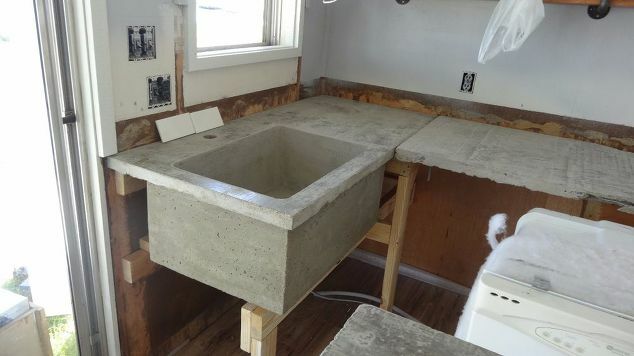 Now for the countertops, we opted for concrete because the price was right. 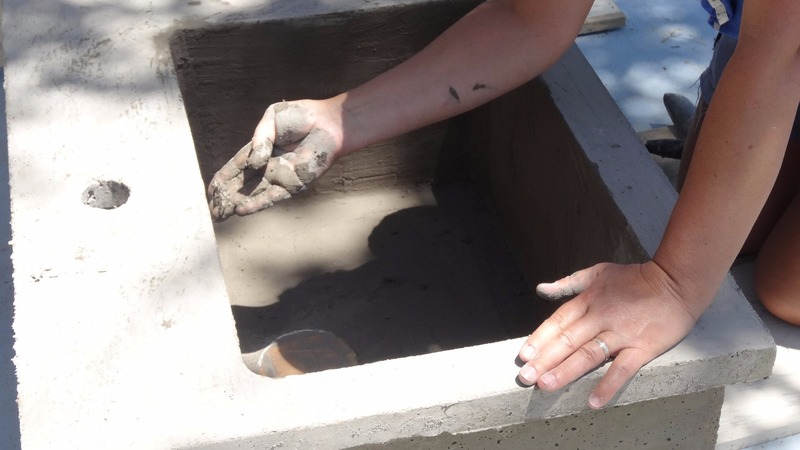 Our concrete bags were around $5.80 per bag and we used about 10 for the entire kitchen. We had never done this before, so we did our research online and made a few mistakes but in the end it worked out...Above you can see the mold we built with 2x4's for support on the bottom, melamine boards 1.5 inches deep to make the mold on the top and plastic at the bottom(which is actually the top). 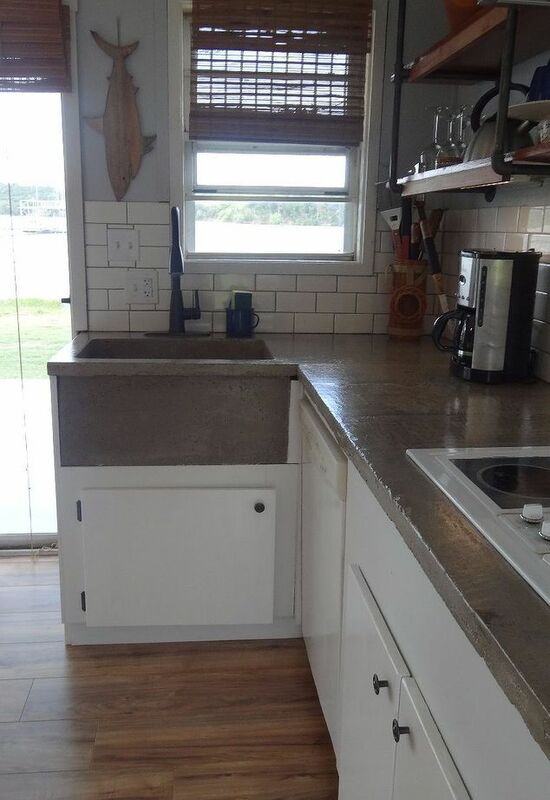 The white square in the middle is the opening for the stove top. As we filled the mold with concrete, we addded some wire and rebar for support. Unfortunately, when we tried to move this particular portion(after it completely dried), it cracked and had to be repaired once installed, which wasn't that big of a deal. It did add some additional time. The countertops weren't that hard, but it was pretty physically demanding. We opted to do them outside because of the concrete sink. 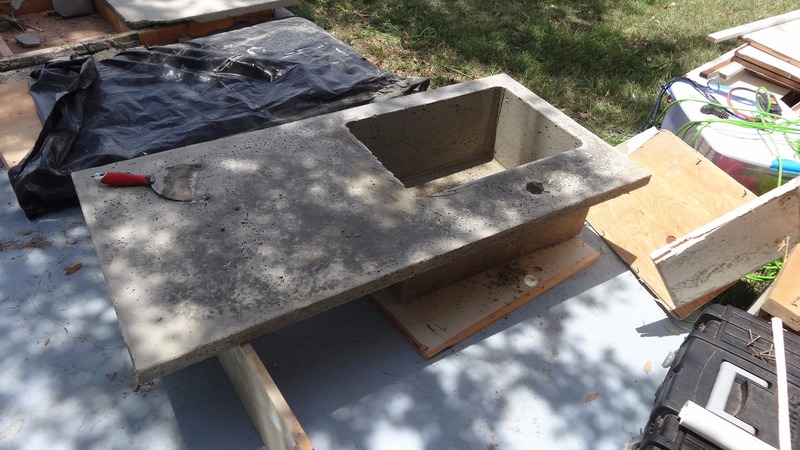 I looked into purchasing a farmhouse sink, but that would have taken up almost half of the overall reno budget - so we made one. 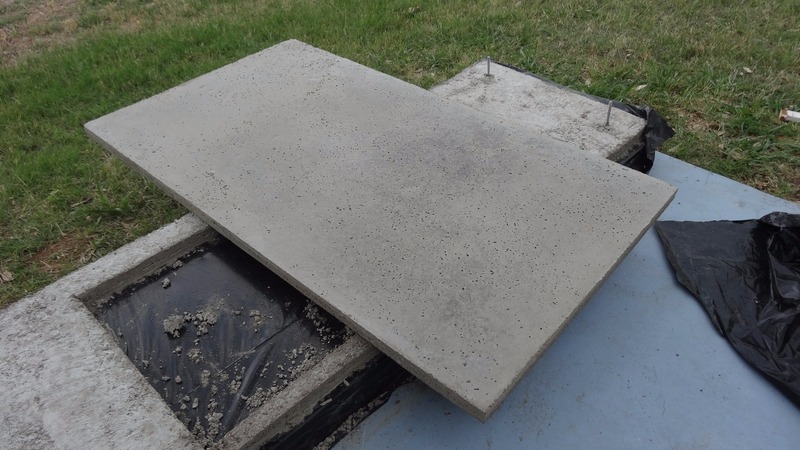 Here is the island, all of these sections had to be sanded then I added a feather light concrete layer (very thin), to fill in any holes, then I sanded again. Here's a look at the sink (from the bottom). And the sink from the top. 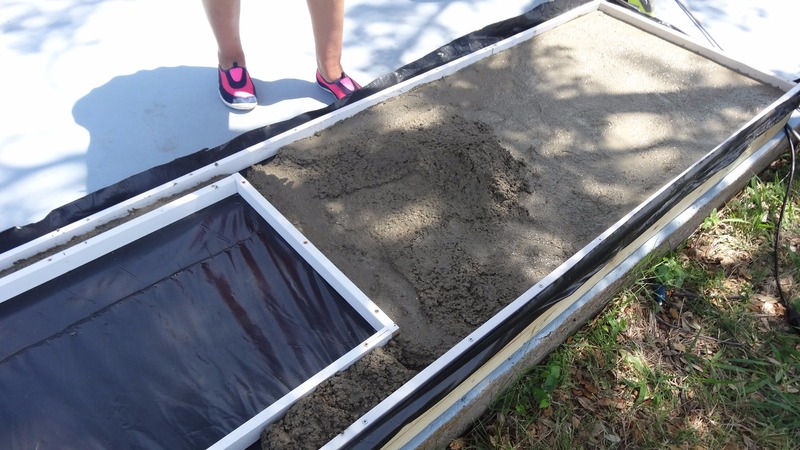 We used a PVC pipe in the correct size as the drain cover hole and one in a smaller size for the facet opening. Because the sink had curved corners, I couldn't use a trowel to add the feather light layer, but had to use my hands. Then I had to sand by hand. While the concrete was curring, about 48 hours but because we were working on this on weekends only, it had a full week to dry. Because of the weight of the countertops and sink, we had to build the cabinets with enough support to handle them. Here you can see our base, using 2x4's. 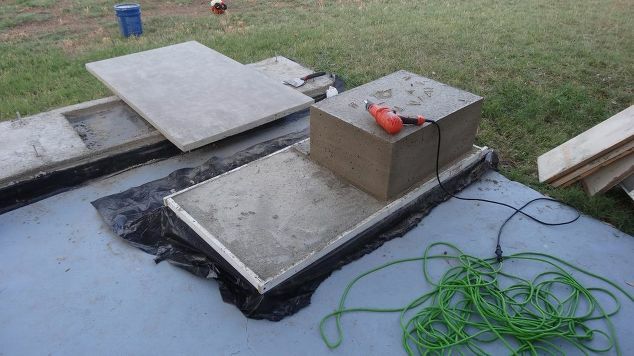 The following weekend, I added hypoxy over all the concrete surfaces. It dries fast, about 20 minutes, I was able to do three coats fairly quickly. In this picture, you can see everything starting to come together. We added the industrial shelving, which is budget friendly and easy to install. We ended up spending around $100 for the wood and the galvanized steel pipes. We added 1 inch bars of wood on the front of the shelves to hide the cabinet lighting on the bottom two shelves. We added the wood to the top shelves for symmetry. We found the two pendant lamps at Lowe's discounted because one had been a display unit (total cost $50 for the pair). 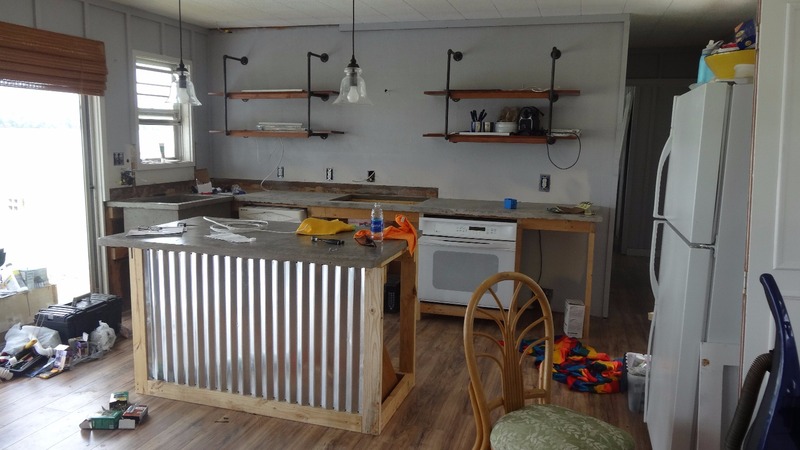 We added the corrugated steel to the outside of the bar, where the white surface of the cabinets aren't practical because of shoe marks. I replaced all the appliances with second hand versions in white. We have a thriving online garage sale in our local facebook community. Here is the area we had to path because it cracked when we moved it - I don't think anyone could tell it was patched. 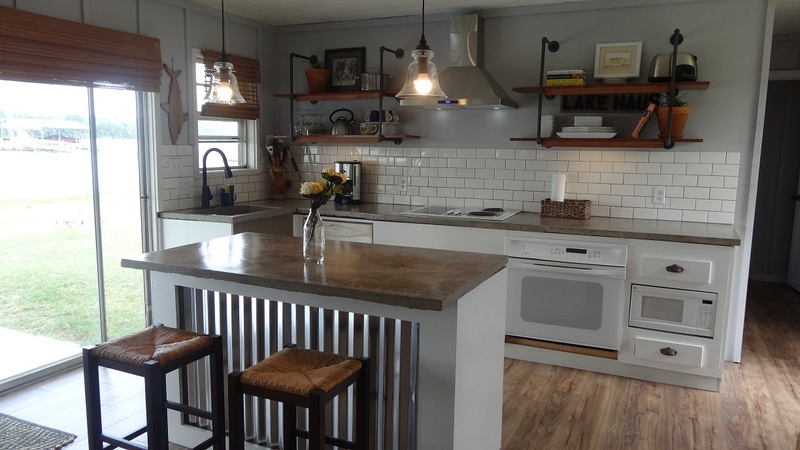 Then it was time for the subway tiles and the one item we purchase brand new, the range hood. I like that it ties in the corrugated steel from the island. We ordered it off of Amazon for $170. The subway tiles were around $60 for the tile, grout and adhesive. We had the tile cutter from the bathroom sink project. 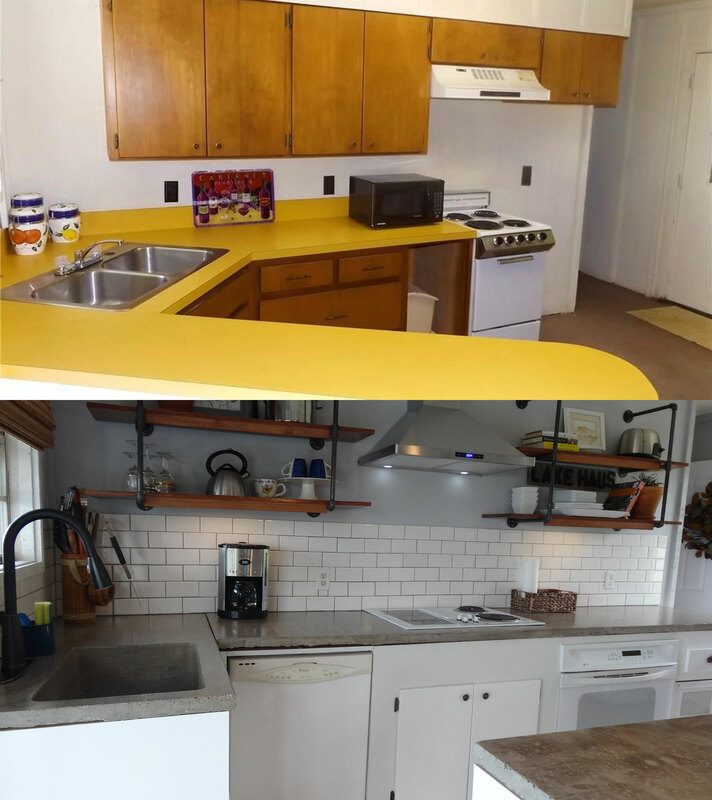 The longest process of the project was then trying to customize the old cabinets and drawers into the new design. This was a hairpulling/teeth grinding exercise in patience ! My husband persevered and finished, then I got to painting the white and spray painted the original knobs a darker color to coincide with the galvanized pipe from the shelves. I had several antique pulls for the drawers that add a nice touch. I was adamant that I did not want the microwave on my beautiful new countertops or shelves, so we build a shelf between the drawers to accomodate. It is a little low but I love that it is out of the way. The finished product, well almost - we still have one board to add under the oven. (next weekend) I can say that I am 100% thrilled with how this turned out! Thank you for some other wonderful post. The place else may just anybody get that type of information in such a perfect means of writing? I have a presentation next week, and I am at the search for such info. I genuinely believe this web-site wants a lot more consideration. I’ll probably be once again to read a lot more, thanks for that information. 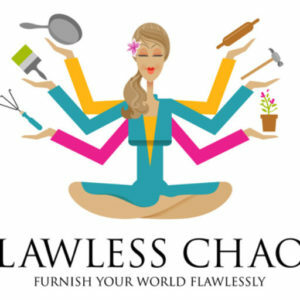 This is the best blog for anybody who needs to find out about this topic. You understand so much its virtually hard to argue with you (not that I actually would need…HaHa). You definitely put a brand new spin on a subject thats been written about for years. Nice stuff, just nice! Greetings, I am truly happy I found out this webpage, I actually found you by accident, while I was searching on Digg for wireless router. Regardless I’m here right now and would really like to say kudos for a tremendous write-up and the overall fun blog (I too love the theme), I don’t have the time to browse it all at the moment yet I have saved it and even added the RSS feed, so once I have plenty of time I will be back to go through a great deal more. Make sure you do maintain the awesome work. I just used hot glue. It holds quite well, but in the event that I’d like to take it down, it will also scrape off without damaging the mirror. Good luck on your project! 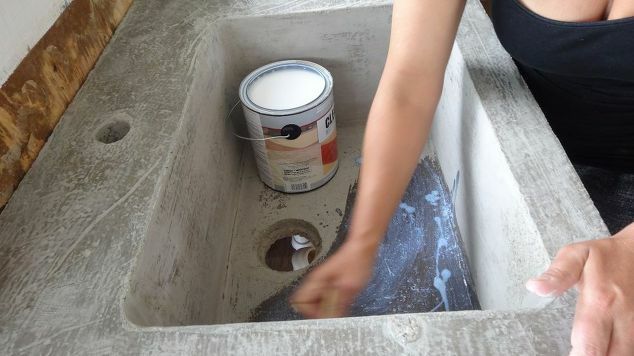 Hello Gina – we bought a product called ClearSeal concrete sealer, which is an Epoxy product at Lowe’s for $28.94. That gallon of Epoxy was enough to coat two complete kitchen (three coats each) countertops and one bathroom vanity. Best way to apply is with a soft roller that will avoid brush marks. Funny, in the before and after photos I did not see a fridge. Where is it located? Beautiful job on your new kitchen. You should be very proud. The fridge had been on the back(main) wall next to a tiny oven. In the renovation, we had to move it to the right side of the house. 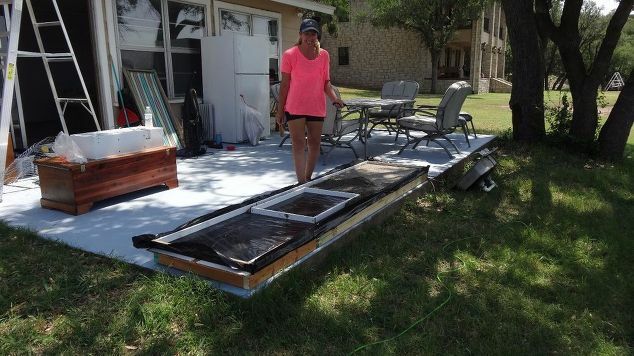 This worked out well because it made the kitchen more of a separate space with the fridge and table located on the opposite side of the kitchen sink/sliding glass doors.